The 8 Bighearted Railwaymen This November during CRPS awareness month a fantastic group of men known as The 8 Bighearted Railwaymen will be challenging themselves in aid of Burning Nights CRPS Support, to loop the UK non-stop from Liverpool Lime Street station by train and ferry where necessary throughout England, Wales, Southern Ireland, Northern Ireland, Scotland and back to England in as short a time as possible and they are hoping in less than just 3 days! 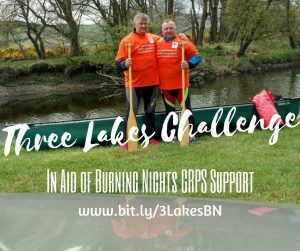 The 8 Bighearted Railwaymen Fundraiser in aid of Burning Nights CRPS Support On 13, 14 and 15 November 2017 the team of 5 railway men will be travelling non-stop throughout the whole of the United Kingdom and Southern Ireland. They will start and end of Liverpool Lime Street Station and they are aiming to do this non-stop journey in less than 3 days which is an amazing and challenging fundraising event! The 8 Bighearted Railwaymen - The team The 8 Bighearted Railwaymen team will be raising money in aid of Burning Nights CRPS Support charity and they will obviously be raising awareness of Complex Regional Pain Syndrome and indeed one of the team is a CRPS sufferer themselves, so this will be no doubt a painful event for them. 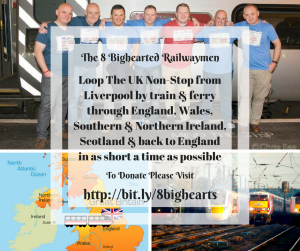 If you would like to make a donation to their challenge fundraising event please visit The 8 Bighearted Railwaymen fundraising page. Their fundraising page will be open until 15 February 2018! We wish every member of the team all the very best and GOOD LUCK for your challenge! 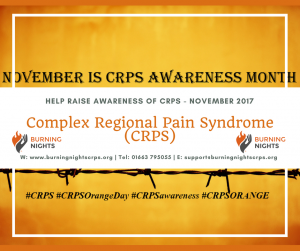 Written: 04/10/2017 LET'S SPREAD AWARENESS of CRPS!